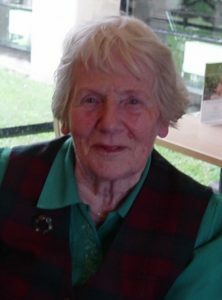 It is with great sadness that we record the passing of Jenny Lindsay (90), a long serving Board Member and Trustee of our Society. Along with her husband Tom Lindsay, who served as a Trustee before her, she was a stalwart supporter of the Society and attended Gatherings on a regular basis until she became unwell just a few years ago. Tom’s parents were also strong devoted Members of the Society, taking a very active role during the 1950s and 60s. Jenny was laid to rest on Monday 13th February joining Tom in the peaceful cemetery of Melrose Parish Church. We were able to convey our sympathy on behalf of the Society to their children James, Ian and Fiona at the service in the Parish Church and afterwards in the Town House Hotel, Melrose where we were able to meet with her loving family of Lindsay children, grandchildren and great grandchildren. Jenny was such a wonderful supportive person and will be sadly missed by her family and friends.